» Which Ranked NCAA Teams Are Poised to Collapse? Before we get started, I’d like to tip my cap to the slam-dunk craze that’s sweeping the country. I called it a “passing fad” on my blog The Old Fashioned Chest Pass back in 1964, but it looks like it’s here to stay. So. No. 14 Georgetown took down UConn 58-44 in one of the Huskies’ worst shooting performances ever. The visitors finished 18-of-60 from the field, and an abysmal 2-of-20 from 3. Their offensive efficiency, which is a measure of how many points they’d score in 100 possessions, was 68.6. 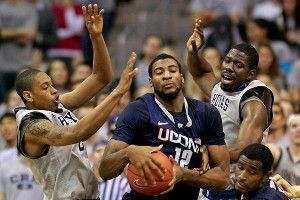 For comparison’s sake, the Division I average is 100.3, and UConn’s usual average is 110.1. Ken Pomeroy’s single-game numbers go back to 2003, and in that time UConn hasn’t even approached a number as low as 68.6. In other words, they made a little bit of the wrong kind of history Wednesday. Which makes it tough to know whether Georgetown truly bounced back from a rough road loss to hapless Pittsburgh and a two-point home win over unranked Rutgers. Every year, starting in early February, there are a slew of teams that begin to lose momentum. They distinguish themselves in non-conference play, survive through January with their rankings intact, and then begin to crumble as the tournament approaches. It’s the “other shoe dropping” phenomenon, if you will. And before Wednesday, it looked like Georgetown fit the description. The Hoyas survived (for now), but let’s take a quick look at the AP Top 25 and see which teams are immune, which seem solid but may have a chink in the armor, and which are in danger of a reality check in the shortest, most miserable month of all. I know I’m going out on a huge limb here, but these are my Final Four teams and they’re going to be just fine. Call these the good coaching picks. I’m a big believer that when Bill Self has a decent team and time to prepare for an opponent, he’s one of the hardest coaches in the country to beat. My theory is going to be put to a severe test in the coming days, as the Jayhawks take on Missouri and Baylor on the road in consecutive games, but I believe this is the best team in the Big 12. As far as the Spartans, they have their chance for revenge against Michigan on Sunday, and then a relatively easy schedule for a couple weeks aside from the dreaded road game in Columbus. Tom Izzo is the master at having his teams peak at the right time, and the rest of the docket sets up nicely. Definitely not the fourth-best team in the country, but the Tigers have proven themselves recently with road wins at Baylor and Texas. I sense a loss on Saturday against the Jayhawks, but they should be able to fight their way through the rest of the Big 12 schedule without much blood loss. The formula for beating Duke this season is simple — pressure the guards mercilessly on defense, and penetrate from the perimeter on offense. Lucky for the Blue Devils, they’re in a weak ACC with few teams who can manage both at the same time. A game against Florida State in Tallahassee and the two UNC contests are potential losses, but otherwise their high offensive efficiency should carry them to a safe landing in conference play. At home, the Gators look like one of the best teams in the country, but an 0-4 start on the road showed the limitations of Billy Donovan’s relatively young team. But that ship has been righted with two straight road wins (against iffy competition, sure), and as the Gators continue to discover their identity, they should be bound for the top 10 and a home win in early March against Kentucky. Both are big, physical teams who play great defense (eighth and fifth in the country, respectively) and have proven that they can compete with top 10-caliber teams. Both are exactly the kind of club that will terrify a 1-seed in the Sweet 16. And they’re nearly immune to a late collapse because they can still win games when they don’t shoot well. The only reason they’re in this category is because the defensive style tends to produce close games against good and bad competition. Only a string of bad luck can derail them. Same as above, but with an even stingier defense and better offensive execution (if not talent). Lots of upperclassmen, a good coach, and a tremendous freshman point guard keep the Wolverines relatively safe. The Bears are a quintessential all-talent-no-system team. When the undefeated season ended with back-to-back losses against Kansas and Missouri, I thought the collapse was on. Three straight wins ensued instead, but the last two were narrow escapes against unranked teams. Baylor cannot protect the glass, in part because of its zone defense, and when guards Pierre Jackson and Brady Heslip are contained, the three great big men become hapless and vulnerable. With a trap game against Oklahoma State this Saturday, and then another Kansas-Missouri double, three straight losses could send Baylor far out of the top 10 and into a spiral. As you might have guessed from the description above, I’m not convinced that the dark days have passed for the Hoyas. I’ve admired their grit from the start, and I don’t doubt that they’re immune from an emotional collapse, but the recent offensive dry spell and a slate of road games doesn’t bode well for their prospects. Plus, if you look at the last three seasons, John Thompson III’s teams have a history of fading near the end. I hope I’m wrong, but I think a similar fate awaits this year’s team. I’m almost forced to put them in one of the “good” categories by virtue of an ongoing seven-game winning streak. But I’m terrified by the five away games remaining on the schedule, starting with Notre Dame on Saturday, and I’m a little gun-shy because of bad losses to LSU and Vanderbilt in December. I think February won’t be kind to Buzz Williams and the Golden Eagles. There are two ways to look at this team right now. The first is that after a hot start and some really impressive wins at home, the Hoosiers have come back to Earth. They’ve now suffered five losses in their past seven games, including a bad one to Nebraska, and the memory of last season (when they lost their final nine games under Tom Crean) is still fresh in everyone’s mind. All signs point to collapse. The other way to look at it is that they’re playing in a very hard conference, and four of those five recent losses weren’t too bad. The schedule gets easier from here on out, and they should rebound. I’ll decide which version I like in about a week. Is that cheating? Sorry. Neither team is very exciting, and both would be out of the top 25 if they played in a different conference. Both will probably make the tournament by default, but both look like second-round exits waiting to happen.